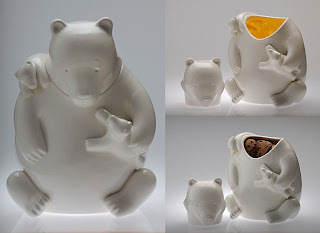 I am in love with this Mama Bear Cookie Jar by Tom Otterness. Isn't it the cutest thing, ever? 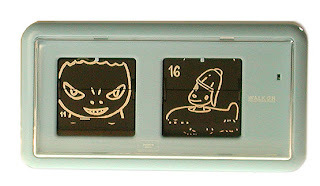 Cereal Art makes the coolest artist-designed objects, perfect gifts. My aunt Ellyn got me the excellent Yoshitomo Nara Too Young To Die Ashtray years ago, I think while I was pregnant with Roo. 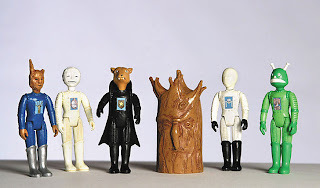 I covet Nara's Flip Clock, too, and Marcel Dzama's excellent Monsters of Winnipeg Folklore Action Figures. P.S. Did I mention Tom Otterness is from Wichita originally? Why, yes he is. Oh wow, I love that cookie jar! 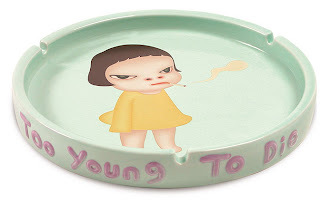 And the ashtray is hilarious, especially for a pregnant lady. omg, these are awesome! I love the plate, ok, fine, ashtray, but I just pretend it's a plate. WOW! what a cool site!